Note: As I have pointed out before, I have a habit of including references to Greek terms in my notes, whether I actually refer to them or not, so I have left them in with transliterations. Introduction: Remember that in last week's post we saw that Paul describes the Christian life as a battle between the flesh and the Spirit (5:16-17) and that he further describes how crucial it is that we follow the Spirit's leading if we are to have victory in the conflict. He even describes walking in the Spirit as similar to the way a soldier follows his commander and heeds his commands. We are like soldiers at war, who must follow our leader – the Holy Spirit – and heed His commands. And, just as when one soldier is exhausted or wounded, the others help to carry the load, even so we must all recognize our responsibility to bear one another's burdens. 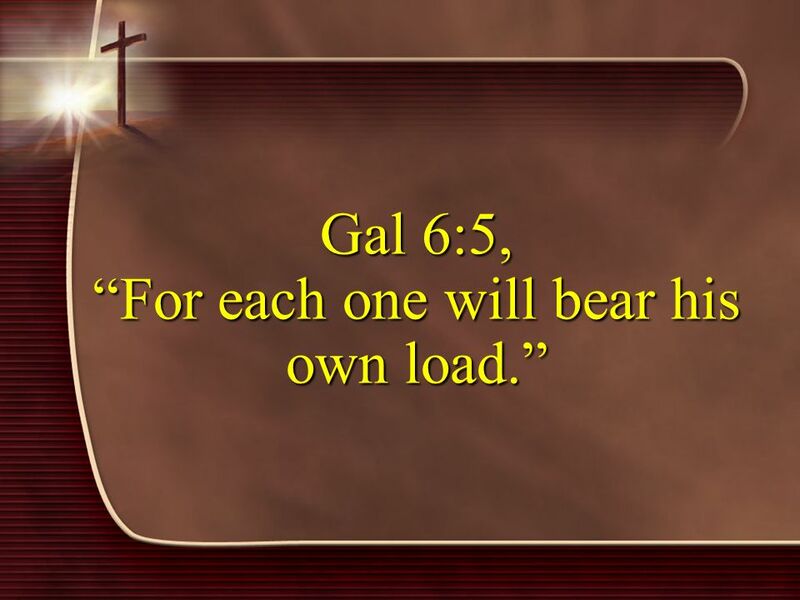 This was the focus of last week's study of verses 1-2, but the focus of today's study is on the responsibility each one of us has to bear his own load. After all, every soldier in battle is ultimately responsible for his own pack. This responsibility is emphasized in verse 5, where Paul gives the reason for what he says in verses 3-4. NKJ Galatians 6:5 For [γάρ, gár] each one shall bear [Future Active Indicative > βαστάζω, bastázō] his own load [φορτίον, phortíon]. So, Paul teaches in this passage that mutual accountability and personal responsibility go hand-in-hand for the Christian. We must never emphasize one without the other. 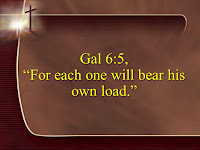 We must each “bear one another's burdens” (vs. 2), and we must also each “bear his own load” (vs. 5). Our personal responsibility before God does not rob us of our accountability to others, nor does it put us on a deserted island to live a solitary life. These are Western problems that need to be faced, and the message of Paul – a mutual accountability that does not deny personal responsibility and a personal responsibility that includes a mutual accountability – stares our world in the face. I make one more observation regarding personal responsibility. In our culture we have become acutely aware of the origins and causes of our behavior. I am aware, for instance, that certain aspects of my personality come from what I learned from my father and mother; I am aware as well that some of my traits (both good and bad) appear in my two children. This is a common perception today. But in this process, at times there is an implicit excuse for our personality traits or our behavior. “I cannot help it,” one might cry, “because this is how I was raised.” Or, “You would not blame me if you knew my past.” We must sympathize here with the obvious reality that what we do and who we are result from what others have made us, and we should not refrain from recognizing that certain bad dimensions of people are not solely their fault. But what the Bible teaches is that we are personally responsible for everything we are and for everything we do, regardless of the causes and problems we might have. This, of course, leads to an entire feature of application: urging people to accept responsibility for everything they do and are. Paul teaches that we must “bear our own burdens” in this regard. NKJ 1 Corinthians 3:10-15 According to the grace of God which was given to me, as a wise master builder I have laid the foundation, and another builds on it. But let each one take heed how he builds on it. 11 For no other foundation can anyone lay than that which is laid, which is Jesus Christ. 12 Now if anyone builds on this foundation with gold, silver, precious stones, wood, hay, straw, 13 each one's work will become clear; for the Day will declare it, because it will be revealed by fire; and the fire will test each one's work, of what sort it is. 14 If anyone's work which he has built on it endures, he will receive a reward. 15 If anyone's work is burned, he will suffer loss; but he himself will be saved, yet so as through fire. Clearly this judgment will not determine whether or not we are saved, which has already been determined in this life when, by God's grace, we embraced Christ as Savior and Lord. But there will be a future judgment that takes into account what we have done with the grace He has given us. In my view, this is what Paul has in mind here in Galatians 6:5. It is not that he is unconcerned with the responsibility we each have to bear our own load now, but rather that we bear it now in light of the fact that we will have to bear it then. And, because each one of us must bear his or her own load, there are two things we must avoid: 1) conceit, and 2) comparing ourselves with others. First, we must avoid conceit. NKJ Galatians 6:3 For [γάρ, gár] if anyone thinks himself to be something, when he is nothing, he deceives himself. NKJ Galatians 5:26 Let us not become conceited, provoking one another, envying one another. NKJ 1 Corinthians 4:7 For who makes you differ from another? And what do you have that you did not receive? Now if you did indeed receive it, why do you boast as if you had not received it? NKJ Philippians 2:3-4 Let nothing be done through selfish ambition or conceit, but in lowliness of mind let each esteem others better than himself. 4 Let each of you look out not only for his own interests, but also for the interests of others. As David Guzik has said, “If I esteem you above me, and you esteem me above you, a marvelous thing happens: we have a community where everyone is looked up to, and no one is looked down on!” (Commentary on Philippians, e-Sword). 1) That we are “nothing” in the sense that we are totally worthless? I think Paul has in mind the latter of these three possibilities. After all, he is speaking in the context of the need to bear one another's burdens by helping one who is caught is some sin, and he warns us to be careful lest we too are tempted (as in vss. 1-2). As we saw last week, if we are not careful, we can start to think that we are better than someone else who is struggling with some sin that we might not be dealing with ourselves. But a spiritual person (as in vs. 1) will realize that he too is capable of falling into sin and will be moved by compassion to help his brother rather than to look down on him. The point here is really that we should be aware that a prideful attitude toward others in their struggle with sin necessarily means that we are self-deceived. In this sense we are tricked into thinking we are something when we are nothing. In reality we are no better than anyone else! We are all just sinners saved by grace! Second, we must avoid comparing ourselves with others. NKJ Galatians 6:4 But let each one examine [Present Active Imperative > δοκιμάζω, dokimázō] his own work, and then he will have [Future active Indicate > ἔχω, échō] rejoicing [Noun καύχημα, kaúchēma] in himself alone, and not in another. When Paul issues the primary command in this verse, that we must “each one examine his own work,” he assumes it is necessary because we are tempted to boast in comparison with others. He uses a Greek verb that means “to examine, to approve after testing or examination. The word was used for the testing of metals to see whether they were pure” (Linguistic Key to the Greek New Testament, p. 519). This word implies a very careful examination that we must each make of our own work, or whatever it is we do with our lives, particularly in service to the Lord. When we each conduct such an examination and find something worthy of approval, then we will each have a cause for “rejoicing” in our own efforts rather than in comparison to the efforts of another. The Greek noun translated rejoicing here in the New King James Version refers to the ground or reason one has for boasting (Ling. Key, p. 519). This idea is better reflected in the ESV and the NASB. I think the KJV and NKJV prefer to translate it rejoicing because they want to avoid the idea that a Christian should ever boast in himself for any reason. They would certainly want to avoid the NIV's skewed translation that encourages a man to “take pride in himself.” Indeed, such an idea seems to go against the very concern Paul has in the context that we avoid conceit. NKJ James 4:13-16 Come now, you who say, “Today or tomorrow we will go to such and such a city, spend a year there, buy and sell, and make a profit”; 14 whereas you do not know what will happen tomorrow. For what is your life? It is even a vapor that appears for a little time and then vanishes away. 15 Instead you ought to say, “If the Lord wills, we shall live and do this or that.” 16 But now you boast in your arrogance. All such boasting is evil. NKJ Ephesians 2:8-10 For by grace you have been saved through faith, and that not of yourselves; it is the gift of God, 9 not of works, lest anyone should boast. 10 For we are His workmanship, created in Christ Jesus for good works, which God prepared beforehand that we should walk in them. NKJ 2 Corinthians 1:12 For our boasting [related noun καύχησις, kaúchēsis] is this: the testimony of our conscience that we conducted ourselves in the world in simplicity and godly sincerity, not with fleshly wisdom but by the grace of God, and more abundantly toward you. NKJ 2 Corinthians 10:17-18 But “he who glories [καυχάομαι, kaucháomai], let him glory [καυχάομαι, kaucháomai] in the LORD.” 18 For not he who commends himself is approved [δόκιμος, dókimos, adjective related to the verb δοκιμάζω, dokimázō, in Gal. 6:4], but whom the Lord commends. We too may boast about what God is doing in and through us. And we may look forward to doing so when we stand before Him in the final judgment, placing all our confidence in what He has done rather than in our own efforts or abilities. As James Montgomery Boice points out, “To use others as a norm is a kind of escape” (EBC, Vol. 10, p. 502). Let us not try to escape the results of careful examination before the Lord, and if we find little or nothing worthy of approval, let us ask the Lord to so work in us that we might look forward to standing before Him at the judgment, whether through saving us from sin or through renewing repentance and faith in a wayward heart. … there is a great difference between introspection and self-examination. The former can easily devolve into a kind of narcissistic, spiritual navel-gazing that has more in common with types of Eastern mysticism than with classic models of the devotional life in historic Christianity. True self-examination is not merely taking one's spiritual pulse beat on a regular basis but rather submitting one's thoughts, attitudes, and actions to the will of God and the mind of Christ revealed in Holy Scripture. Amen! I hope we will all take time this week for such self-examination, and perhaps, if we need to, ask help in this regard from our brothers and sisters ion the Lord. Excellent teaching, my brother. While our flesh wants an excuse to be selfish, Scripture gives us none. Press on!